Importer and Exporter are applications that allow you to automatically transfer data and documents into and out of docMgt. With each release we strive to make these tools more powerful and flexible without making them too complicated. Of course, this is also our company mantra so it makes sense that each client tool we create follows the same philosophy. Importer and Exporter Add-Ins provide more capability than the base products. Importer and Exporter have been recently enhanced with additional Add-In capabilities. You can do more with Add-Ins than ever. Add-Ins can now interact with the Data values themselves, add to the log files, convert documents and much, much more. As a bonus, Public Add-Ins can now be installed from the cloud using the configuration screens as shown in this image. The use and configuration for each Add-In is different but the concept is the same. All Add-Ins are built to add functionality that is not available in the base product. Below you will find a list of the Importer and Exporter Add-Ins available at this time. Here is a list of the publicly-available Add-Ins for Importer as of this writing. 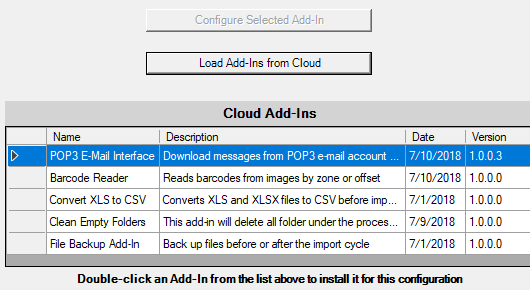 POP3 Email Retriever – Retrieves emails from a POP3 account and saves them into the import folder for processing. Bar Code Reader – Reads most standard bar codes from incoming images for indexing purposes. Bar Codes can be detected by offset or by zone. Convert XLS to CSV – Converts XLS and XLXS files to CSV for import. This allows importer to work without having to manually convert your spreadsheets to CSV before import. Clean Empty Folders – Deletes empty folders after processing. This is useful when processing sub-folders and you wish to clean them up when done. File Backup – Copies or moves files before or after importing is completed. This is useful for making backup copies of import files and for moving files into the Import folder before the import happens. Here is a list of the publicly-available Add-Ins for Exporter as of this writing. PDF Merge – Merges all exported PDFs for a given Record into one PDF. Merge Records– Merges all exported Records into a single CSV file. By default, Exporter will create a single CSV for each Record. This Add-In allows you to have all Records merged into one CSV. Document Mover – Moves documents to other folders after export. We will continue to create new Add-Ins for Importer and Exporter as the need arises. If you update to the latest version of each tool you will be able to see what Add-Ins are available from the Add-Ins tab of the configuration screen. If you are a .NET developer and wish to write an Add-In for Importer or Exporter, contact support to get Visual Studio templates for each. They will greatly simplify your coding and will make Add-In development a snap! Exporter – What and Why?